Mushrooms have been treasured throughout the Orient for centuries for preserving health, curing disease, and maintaining vitality. Maitake (Grifola frondosa) are considered the king of mushrooms because they are not only a scientifically proven potent medicinal food, they are also a prized culinary delicacy. 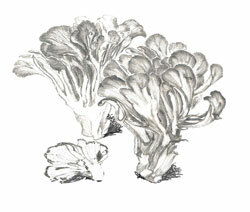 In traditional Japan, where wild maitake often grew to be one hundred pounds, they were considered premier mushrooms. Maitake literally means "dancing mushroom" in Japanese, because people who found it deep in the mountains began dancing with joy. Our supplier, The Yukiguni Company, is the most famous and respected medicinal mushroom grower in Japan. Beware that other maitake products may be imitations from China. Mitoku Yukiguni Maitake is also a culinary treasure and is exceptionally delicious! This Maitake has absolutely no additives and is the exact same product used in the scientific studies and treatments in Japan. Mitoku Yukiguni Maitake - 1.05 oz.